A few weeks ago the 7PM project ran a competition to win a Rhianna CD, and all you had to do to enter was leave a message on their forum describing what your favourite thing is that starts with R, and why? I ended up writing a mini-essay as my competition entry so I thought I might as well post it here and tell the world why my favourite thing that starts with R is Rome! I went to Italy in July of 2009 for a weeklong holiday, incorporating a few days in Rome, a daytrip south to Naples and Pompeii, then up north through Pisa, Florence, Venice and finally to my mum's birthplace of Trieste. 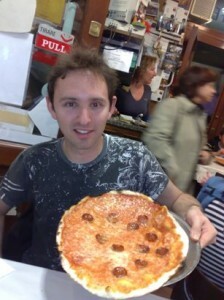 I have many fond travel memories of my European adventures, but one of the fondest of them all was the evening I went to a small and quite hard-to-find pizzeria in central Rome called da Baffetto. It was just around the corner from Piazza Navona, and it was suggested by my trusty guidebook to be the best pizzeria in the city. It actually looked quite dodgy and run-down from the outside - you couldn't see inside the windows because they were blocked out with newspaper - but the smell was heavenly, and there was a substantial lineup of people waiting outside the front door, so I decided to give it a go.